The ageing process is one that is complex and unique to the individual. From a surgical point of view, the doctor has to fully understand all the facets of ageing. This is the only way they are able to address those outward symptoms of growing older. The ageing symptoms are many and varied but most fall into the categories of sagging contours, folds and volume loss. As we all get older, the “beauty triangle” goes into reverse. One of the first things we notice is sinking cheeks. The jawline soon follows. Its contour starts to wane as the skin loosens. There’s also a notable loss in volume in the temple area and the upper face. The older we get the more noticeable these things become. To see the beauty triangle we have to return to a more youthful looking face. Look at the cheeks, which is the widest point on a human face. Imagine the cheeks as they taper down toward the chin. This is the imaginary triangle, or beauty triangle in a young person’s face. As we grow older, we lose this. First the width across your cheeks decreases (drops off). As this happens you lose definition along the jawline, thus making it the new widest area on the face. To put that into simple terms, your beauty triangle has flipped or reversed. 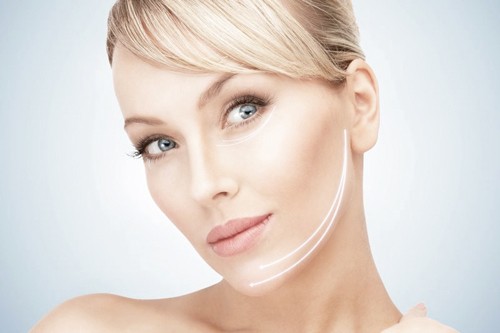 The aim of a non-surgical “V” lift is to give the patient back their beauty triangle. The surgeon’s job is to return your face to its former, younger looking shape and definition. The non-Surgical V-Lift (also called a Liquid V-Lift™) is quite a new concept. It’s a treatment that doesn’t need any invasive surgery. This is the kind of news people have been waiting for, and now it’s here. Not everyone’s face ages the same way, and each face is totally unique. What someone has corrected depends on the individual’s needs and their expectations. The list above is what makes up something we call the twelve point facial “V”. These are the 12 areas on a face for “potential” intervention. What the surgeon uses to target certain areas of your unique “V” shape will depend on what you agreed on at the consultation. 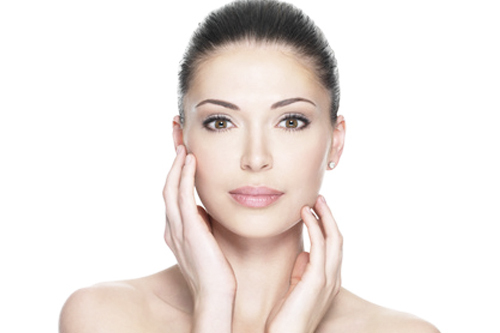 Your doctor should be an expert injector and well-practiced in the use of dermal fillers. The consultation is important. This is where you get to ask questions and get a full understanding on procedures, expectations and fees. A qualified doctor will do a thorough assessment of your facial anatomy. They will also study your skin condition before making any recommendations. A good surgeon listens carefully to you and what you expect from the treatment. At the end of the meeting the doctor presents you with Liquid V-Lift rejuvenation remedy. They will tailor their solution around your specific requests. That’s about it. If you agree to go ahead, then all you have to do is make a date for your non-Surgical V-Lift. Singapore is a safe and well-respected cosmetic surgery hub, so if you’re in the region, be sure to stop by and pay us a visit. The Non-Surgical V-Lift can be an incredibly impressive minimally-invasive treatment when performed by a skilled surgeon. BOTOX results may take between five and seven days to fully materialize. As for tissue fillers, the result of these is apparent immediately. But you can expect even better results as they settle in over the coming days. Remember that every person is unique. That means we don’t all respond to treatments in the same way. Your rate of metabolism determines your end results. How long the results last also varies from person to person. Note that less mobile areas of the face, such as the chin for example, will last longer than the more mobile areas. Some people also opt for laser treatments in combination with their “V” lift procedures. Whether this is right for you or not depends on your needs and expectations. If it’s something that might interest you, be sure to bring it up at the consultation. Laser treatments can help to better resolve a whole host of age-related issues. Some of these include hyperpigmentation (age and sun spots), blemishes, and uneven skin tone and texture to name just a few.